Hadoop File System was developed using distributed file system design. It is run on commodity hardware. Unlike other distributed systems, HDFS is highly fault-tolerant and designed using low-cost hardware. 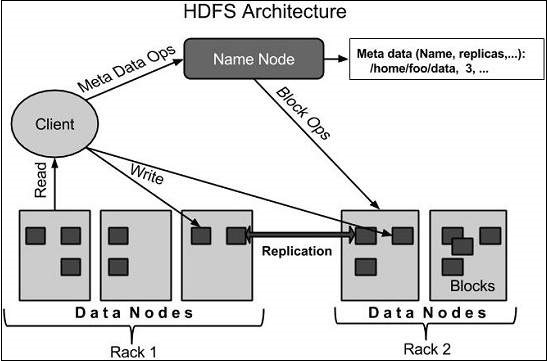 HDFS holds very large amount of data and provides easier access. To store such huge data, the files are stored across multiple machines. These files are stored in redundant fashion to rescue the system from possible data losses in case of failure. HDFS also makes applications available to parallel processing. The datanode is a commodity hardware having the GNU/Linux operating system and datanode software. For every node (Commodity hardware/System) in a cluster, there will be a datanode. These nodes manage the data storage of their system. Generally the user data is stored in the files of HDFS. The file in a file system will be divided into one or more segments and/or stored in individual data nodes. These file segments are called as blocks. In other words, the minimum amount of data that HDFS can read or write is called a Block. The default block size is 64MB, but it can be increased as per the need to change in HDFS configuration.